The Sleep Fairy is a lovely children’s book aimed at young children who are perhaps a little reluctant to go to bed and stay there. I’m sure that’s something that many parents are very familiar with though I’m glad to say those days are long behind me! 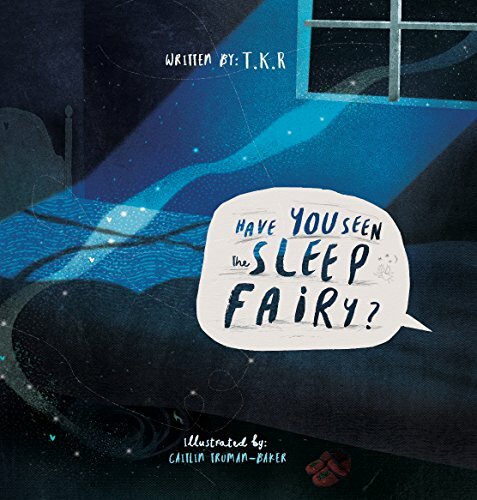 The exhausted parents in this book tell their children about the very shy sleep fairy. She only comes if children are asleep and they will know if she’s been by the sleep in the corner of their eyes when they awake. If they sleep all night, she will leave a small treat under their beds. After a few nights, she trusts them to continue sleeping through the night and they will only know she’s been by that sleep in their eyes. This would be a perfect book to read to your child last thing at night, particularly if they are not so good at staying in their beds. It would be a good way to gently encourage your child to sleep and by stressing the sleep fairy only comes when they are asleep will hopefully encourage them to stay in bed. Children will enjoy looking at the pictures and chatting about what the Sleep Fairy might bring the children in the book. It is beautifully illustrated throughout by Caitlin Truman-Baker and I must mention the calming, tranquil colours which are a strong feature of the book. Having been there and done that, I’d say anything is worth a try when you need a good night’s sleep! So if you have a little one who is reluctant to stay in their own beds and go to sleep at night, read them this book. You never know, it just might work. Have YOU seen the Sleep Fairy? This is the story of a sleep deprived mother and father who are rescued by this shyest of fairies, who only comes out at night when all the children in the home are asleep. She helps children get into the habit of sleeping through by leaving tiny items of interest under their beds for a few days until she can trust them to sleep through on their own. This sweet story is simply told by the author and beautifully bought to life in this new illustrated children’s story. Get your children into the habit of sleeping through by reading The Sleep Fairy to them and applying the idea to your family routine. Here’s to you and a peaceful night’s sleep. About the author: Living in Chelsea, London with his wife and four children author T.K.R is no stranger to sleepless nights. When not writing children’s books, he runs his own business, Captivate Marketing (Pty) Ltd which focusses on the tools and tactics associated with amplifying his clients’ global brands.